Lara Croft has grown into a complicated character. With a turbulent history of lows and highs spanning more than 15 years, and a modern reboot that suffered controversy months before hitting shelves, Lara's persona has become a difficult voice to wield. Recently, The Escapist had an opportunity to discuss the challenge with the woman responsible for crafting the new Lara, writer Rhianna Pratchett. Pratchett is an industry veteran, having written for games as diverse as Overlord, Mirror's Edge and Heavenly Sword. Via email, we asked what it was like penning Lara for a newly-imagined Tomb Raider, the future of story in videogames, and what tea with the Overlord would be like. 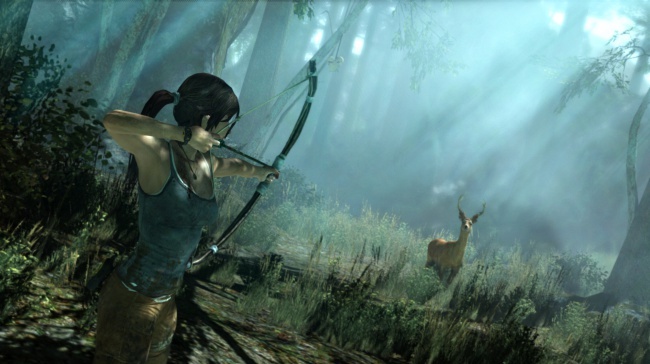 Lara Croft is an extremely well-established character, in ways both good and bad. As a writer looking to start fresh, how do you identify which elements are core to the character and which are safe to scrap? The Tomb Raider trailer created a great deal of controversy because people felt that it implied that Lara would have to go through a sexual trauma in order to become the heroine we know today - that unless she was assaulted, she'd never find the inner strength she needed to overcome obstacles. How did you feel as that storm grew? Did it ever make you consider changing the way Lara is presented in the game? I can completely understand why people were initially upset, but it really is important for players to see, and judge, that scene in context. Only then is it more obvious that the scene isn't about the guy's fumblings, but Lara's reaction (which wasn't fully shown in the trailer.) If we felt that sexual assault was important for Lara's journey, then it would have been used much more strongly. But we didn't, so it isn't. What you see in that scene is very honest and appropriate for those characters in that moment. It's not prolonged. It's not done for titillation. It's uncomfortable, yes. Because it should be! Character is not built in a few fleeting moments, but by a series of challenges, actions and reactions. Lara has already faced quite a bit of adversity before that scene and will go on to face many more. There is no magic switch to bad-assery. One of the things we wanted to explore was: "What does it mean to take a human life?" Too often characters are heroic, quippy, together and everyone's mate in cut-scenes and then go on to perform mass genocide during the levels and it never feeds back into their character. We wanted to address that and show someone reacting in a very human way to being forced into a situation where they have to take another human life. But in general, game characters do tend to be on the uncooked side (both male and female) and we certainly lack the diversity of other entertainment mediums. I'd love to see a broader spectrum of gender, age, background and ethnicity in our game characters. I'd be really stoked to see a female military character (and not just a female option) front a game. What changes would you like to see in how stories are being told in videogames? Where I would like to see the sector evolve is not so much in how stories are being told in games, but how they're being put together. Writers are still, by and large, involved too late in the development process, which severely limits what they can bring to a project. And when they are involved, it can often be very hard to get the power and agency needed to really make the most of a narrative - unless you're the likes of Ken Levine or Tim Schafer. The industry has generally embraced the idea that using professional writers is a good thing, but it still has some way to go before it learns how to use them properly. Which games made you rethink how stories could be told in videogames? I really loved the way that Psychonauts used level design as storytelling. It really made a huge impact on me - especially the parts where you find characters' secret rooms and discover some of the sadness and horror they were hiding. Likewise, BioShock is a master class in environmental storytelling and really showed how textured a game's narrative could become. What one thing do you consider most vital to your writing process - could be a place, a thing, a frame of mind, a time of year, anything. Aside from rather obvious things like my laptop and the internet, it might be something along the lines of my "Winter Office" - a.k.a. bed. There's nothing like a duvet cave to help percolate those creative juices. There's a fake Rhianna Pratchett on Facebook - a sure mark of fame. How do you feel about that? It's a little bizarre. I'm hoping it's just a trans-dimensional blip, and she's actually an alternative me. It's handy knowing that I have a spare. What piece of feedback or advice have you received that you found most helpful? Probably the good old "writing is rewriting." Nowhere is that more the case than in games. The shaping and editing part is fundamental to the writing process, but not nearly enough time is set aside for that when it comes to game scripts. The Overlord, Faith from Mirror's Edge, and Lara Croft are together one afternoon, having tea. What do they talk about? The Overlord doesn't actually speak, so he'd have to bring his entourage of Gnarl and the rest of the Minions. Gnarl would probably try and lure the two ladies back to the dark tower to become mistresses. I doubt he'd have any success, but Lara would probably be interested in viewing it purely for its archeological significance. I imagine that the chinaware would be utilized as headgear, the Red Minions would be used to make toasties and there could be a jump-off competition between Lara and Faith. I'm probably overthinking this.